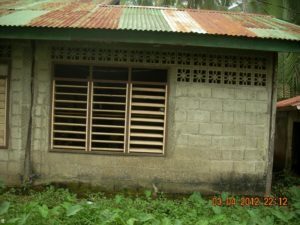 In addition to taking care of the children, Inday has been busy with projects that needed done at the children’s home. View of the roof and ventilation blocks. There is the annual coating of the roof with the sealant. The metal roof expands and contracts and over time causes the nails to make elongated holes around each nail. The roof coating seals that and prevents water from coming into the rooms underneath. 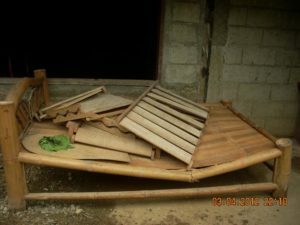 Inday and Babeselle shared a single bed with a frame made from bamboo. 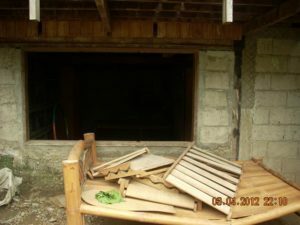 Wear and tear as well as a little help from termites or other insects caused it to finally break. The two of them had to sleep on the floor. Inday was able to get some wood and had her brother help build a bed frame. Because Babeselle is as big as her mother, the two of them were crowded in the single bed, so they built the bed the size of a double bed. However, the piece of foam that they use for a mattress only covers part of the bed. Inday has Babeselle sleep on the foam and she sleeps on the wooden slats covered by a blanket. She says that Babeselle has to work so hard in school that she wants her to get well rested. She said that if she gets tired, she can take a nap when the children are at school if the little ones will let her. I can guess how often that happens. That does sound like a mother’s love. Right now, a remaining concern is how to keep the rain water from coming in the ventilation blocks that are at the top of the wall when it rains and blows. Hopefully they can come up with a solution to that problem. Sorry for the type’os…but they are a bit funny! I understand about typos. Occasionally I try to spell something and my spell check or auto correct is totally confused. Also, check your email. I sent you something a couple weeks ago.